Today marks 250 years since Arthur Guinness signed the legendary 9000 year lease on the St. James Brewery. To help mark the occasion, Guinness has brewed up 250 Anniversary Stout, a new beer available in America, Australia, and Singapore. The first new Guinness in the American product line since Guinness Draught first showed up on our shores in 1967, Guinness 250 Anniversary Stout is the biggest Guinness-related news here in quite a while. It's not meant to be a permanent change though, as Guinness only plan to brew the beer for a limited time only. Unlike big brother Guinness Draught, 250 gets it's bubbles purely from carbonation, with no nitrogen. This makes for a sharper mouthfeel. 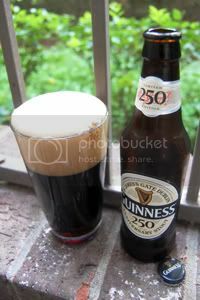 Guinness describe 250 as "a distinctive carbonated stout with a clean, smooth finish." Why the change? According to master brewer Fergal Murray, this beer "is more about refreshment and zing" than Guinness Draught. Other changes include a different mix of malts, a higher alcohol content, and a new "triple hop regime." There's no better day than today to raise a pint of the black stuff, so let's get to it. Appearance: A dark brown, nearly black body with laser-red highlights. Up top, two fingers of creamy, dusty-tan head that sticks around for a while and leaves good lacing on the way down. Aroma: Cocoa and a little dark fruit over a mild roasted-malt base. It's rather similar to Guinness Draught, but with a little more fruit character. Taste: Roasted malt with nutty, chocolaty and dark-fruity notes. It's not exactly the most complex brew out there, but it was never meant to be. The aftertaste is nutty and roasty. Mouthfeel: Medium bodied and creamy with a drying finish. There's certainly more carbonation than you get in nitrogenated Guinness products, but what's here is still rather smooth. Drinkability: Like it's big brother, this goes back rather quickly. Verdict: A decent enough brew, and a fitting tribute given the source material that is Guinness Draught, but not exactly an earth-shaker. If you are (or used to be) a Guinness fanatic, this is worth the price of admission. Congratulations to Guinness on 250 years!